Mukavaa helleviikon alkua! 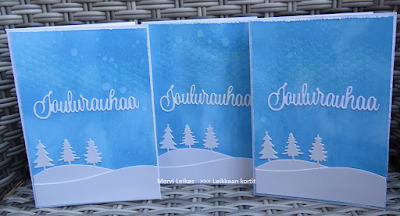 Minä aloitin viilennyksen tekemällä muutaman joulukortin! Taustat on mixed mediaa, Distress Oxideja ja tekstuuripastaa, sabluunan läpi. Muuten käytin stansseja (IO ja Heidin korttipaja). Oh it's really hot! I made some Christmas cards today to cool down. Backgrounds is done with Distress Oxides and texture paste and stencil. 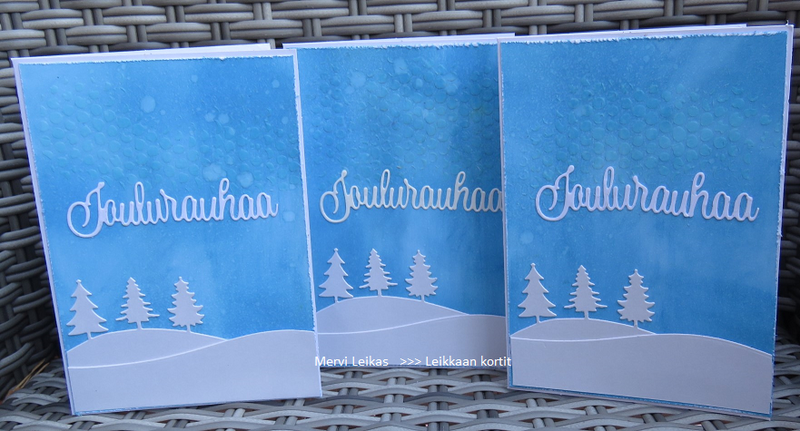 Diecuts are Impression Obsessions' and Heidin Korttipaja's. That made me laugh, lovely cards. Good idea! I hope it helped you to cool down! I love your cards! 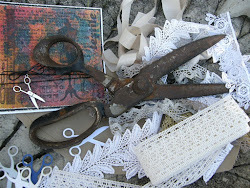 Thank you so much for entering our ATG challenge at Crafter's Castle this week. We hope to see you next time too! Beautiful winter scenes, the paste adds some subtle texture for snow. Perfect cards for postage.